Click to titanosaurize. Trust me. I was in Philadelphia a couple of weeks ago to work with Liguo Li, of Yongjinglong fame, and I took a day to run up to New York for a quick day’s work at the American Museum of Natural History. It was my first time visiting since the cast skeleton of Patagotitan went up, so it was my first chance to see that beast in the flesh (so to speak). The pano up top is mine, but the other two photos here are by Liguo. I’m writing with my thoughts on the mount. You can walk all the way around it, with no glass in the way. It’s very convincing. The casting job on the real elements is superb, with all of the cracks and so on faithfully recorded. And the vertebrae they had to sculpt look pretty good. The spotlights aimed at the neck cast these immense shadows of the cervical vertebrae on the far wall, which is cool (see below). 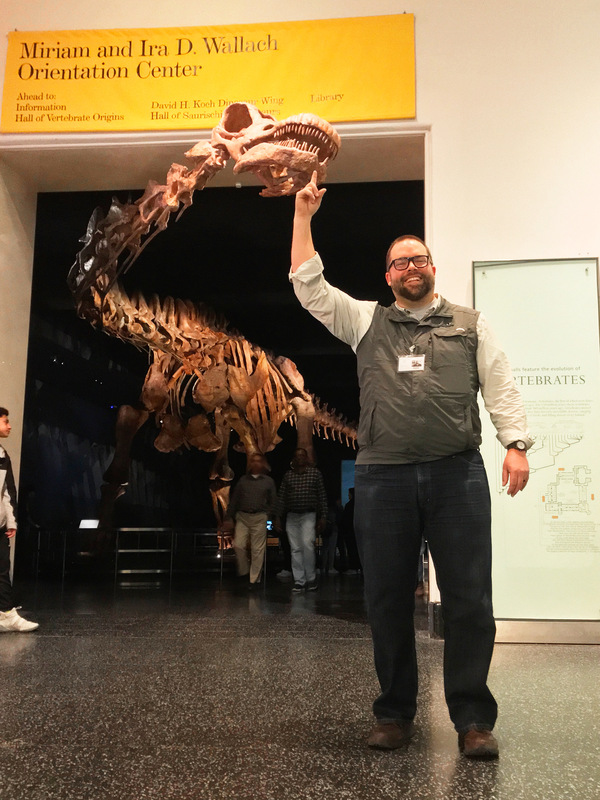 Now the AMNH has mounted skeletons of Brontosaurus (or some apatosaurine at any rate), Barosaurus, Kaatedocus (masquerading as a juvenile Barosaurus in the rotunda), and Patagotitan – that’s pretty not bad. I’m hard pressed to think of another museum in the Western Hemisphere with so many mounted sauropod skeletons. Carnegie, maybe? Someone help me out, here. 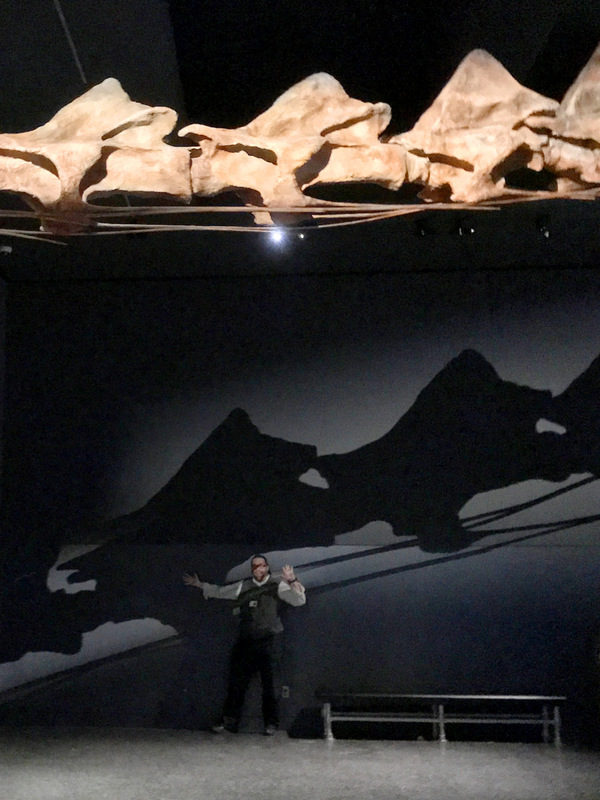 In striking contrast to the well-lit, mostly-white aesthetic of the rest of the fossil halls, the orientation gallery holding Patagotitan is mostly in near-Stygian darkness. Shoot in HDR mode if you can. The head poking out into the hallway is a nice trick (see also: Sauroposeidon at the Oklahoma Museum of Natural History), but it means that one of the focal bits of the animal is in a different lighting regime, which makes photography even trickier than it might otherwise have been. The mount feels a bit…cramped by the geometry of the room. Of the AMNH mounted sauropods, it’s easily in the worst space. If you ask me, they should have dethroned Barosaurus from the rotunda (religious commitments notwithstanding) and put Patagotitan there. The Patagotitan mount that is going in Stanley Field Hall at the Field Museum is going to look much more impressive just because of the setting. In all, not bad, could be better. It was fun for me because the longest cervicals of Sauroposeidon are veeerrry slightly longer than the longest of Patagotitan, and now that Sauroposeidon is coming out as a titanosaur in most analyses…it might have been friggin’ immense. So, yeah, go see Patagotitan, and all the other good stuff on display at the AMNH. That second photo is where all the win is, for sure. It’s very hard to get a sense of scale from the first one, and of course the last is played for laughs and makes Patagotitan look tiny. But, even knowing that the shadows are way bigger than the actual elements, I felt a sense of legitimate awe at the second photo. I’m hard pressed to think of another museum in the Western Hemisphere with so many mounted sauropod skeletons. Carnegie, maybe? Someone help me out, here. Obviously the Museum für Naturkunde Berlin has three: and, since two of them are real skeletons of Giraffatitan and Dicraeosaurus, it might still have the AMNH beaten for sheer awesomeness. I’d need to see Paragotitan myself to make a call. But our national shame here in the UK is of course that our National History Museum now has one (1, I counted it) sauropod — and that is the crappiest cast of the crappiest camarasur that ever masqueraded as the member of the greatest clade on God’s Earth. As a result, our nation’s most sauropodous museum (and hence its best museum by any reasonable measure) is … drum roll … the Leicester City Museum that is home to the Rutland cetiosaur. Four seems like the magic number for sauropods in big American museums. Carnegie has Apatosaurus, Diplodocus, Camarasaurus, and the baby apatosaurine. Once Patogotitan is installed at the Field, we’ll have that plus the apatosaurine, Brachiosaurus, and Rapetosaurus. Great post, and I love this mount. I wonder if the new one getting put up in Chicago will have a vertical neck posture which would be more realistic than the posture shown in the AMNH mount. Another amazing thing is they say this dinosaur wasn’t even fully grown when it met its untimely demise. Ditto for the Fukui Prefectural Museum in Japan. I haven’t really kept up with the East Asian museum scene, which is precisely why I stuck to the Western Hemisphere in the post. Not denigrating the Eastern Hemisphere museums, more airing my ignorance. The Tianjin Natural History Museum also has quite the plethora of sauropod mounts, although most of them are stuffed at the entrance with some random cast of AMNH 5027. Did these wonderful beasts really have those gaps between their front teeth?! They could chomp down AROUND a tree branch, and just pull back to rake off… surely not all, but most of the leaves or needles, potentially leaving enough of the thinner newer grown that it wouldn’t kill the tree, allowing it to regrow for later re-harvest. Which kinda parallels the concept of a pack of allosaurus following along, biting non-fatal chunks from the sides of these giant herbivores. That makes sense to me, Brad. Though I believe healthy sauropods would have fewer/smaller gaps between their teeth than some reconstructed skulls seem to show.